Here are some questions that consumers ask when making their choice. The benchmark product is the ham and these answers mainly deal with this type of cured meat, but are applicable to other pieces. Do not be fooled, a serrano ham simply designates a ham from the Spanish Sierra (mountain). It does not carry any notion of origin or of breed. Hams which are called serranos can also come from non-Iberian pigs. This is one of the essential criteria that must be taken into account when purchasing. Intensively-bred white pigs may carry the "Serrano" tag, but this is not an indication of quality. Iberian ham implies a notion of breed and purity, of pedigree. Made from black pigs, the best, which, since the 2014 standard, are called Pata Negra. It is a particular breed, which has physical characteristics totally different from other breeds: short fur, dark skin, thin legs, long snout and ears, etc. Since 2014, a pig that is not 100% Iberian (genetically 100% pure Iberian breed) cannot be called Pata Negra. Note: there are other black pigs which are not Iberian pigs (the black pigs of Bigorre and Corsica, for example). Are all Spanish denominations made from Iberian pigs? 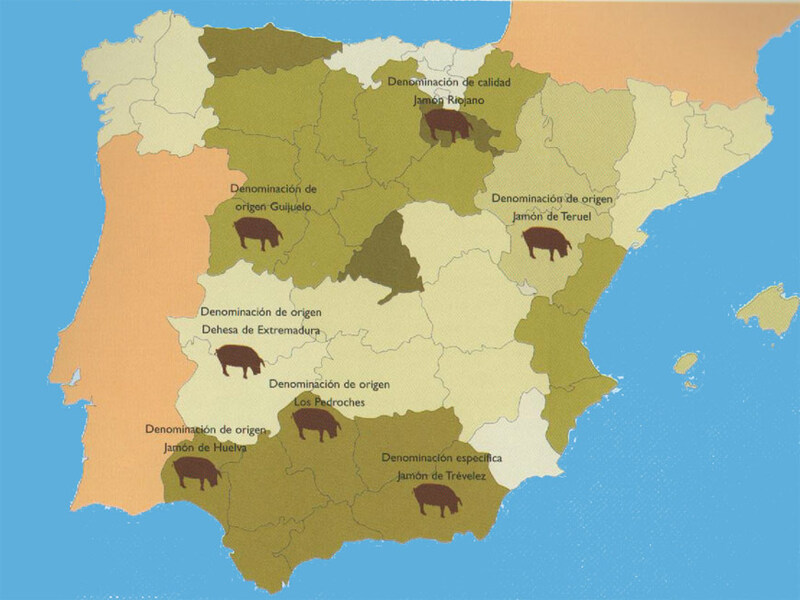 For non-Iberian breeds, the Spanish Ministry of Agriculture recognizes 3 main areas: D.O. Jamón de Teruel, Denominación específica Jamón de Trevélez (to the south of the Sierra Nevada) and Denominación de calidad jamón Riojano. Do Iberian pigs feed exclusively on acorns? No. In reality, the pig naturally feeds on herbs, fruits, and small insects or reptiles found in the pasture (dehesa) and its diet is not composed solely of acorns, for the simple reason that acorns are not available all year round. In addition, from birth and throughout its growth, the pig needs another element in its diet (fodder, vegetables, cereals, etc). It is from autumn, at the time of the montanera, when the pigs rout under the oaks in the dehesa. Not all pigs have the same diet, as there are not enough acorns for all the pigs. In fact, depending on the producers, it takes one hectare of oaks for each pig. How do I recognise an acorn ham? It isn't easy, since there are many fakes. Depending on the curing time, the external colour of a piece tends to turn black, and this may cause confusion. While it is easier to tell from the inside of a piece, this isn't always possible. The safest way is to look at the label, since it contains all the information about the product (producer, quality, provenance, etc.). The white spots should also be taken into account. They are sometimes scattered over the flesh, which are associated with the slow curing and maturation process of the leg. The degradation of the proteins present in the meat causes the formation of these small crystals of amino acids, called tyrosine. The presence of these white crystals is generally indicative of higher quality. How much does an Iberian ham weigh? The weight of a ham varies between 6.5 and 9 kilos, and can be too fatty, too dry, etc. The ideal weight is between 7.5 and 8 kilos. After the important curing phase, (generally a minimum of 3 years for Acorn hams), its weight is greatly reduced. What is the edible part, which can be cut? About 40- 50% of an Iberian ham is wasted. This is more than for white pigs. The waste is essentially the bone, the fat (tocino), its rind, and obviously the hoof. For paletas, this percentage rises to 50 - 60%. For example, approximately 2 kilos of slices can be taken from a paleta of 4.5kg. What is the difference between a ham and a paleta? These farmer's essentials are derived from the same animal (the two front legs and the two back legs). Hams (hindlegs) are better known than the paletas (front legs), from which wider and more regular slices are taken. However, the flavour and the taste are practically the same - the difference is in the price. The hams are more expensive, since they are bigger. How long is the curing time? The duration varies according to the weight and size of the ham or the paleta. A large acorn ham (10 kg) can have a curing process of 4 or 5 years. On average, the hams remain in the cellars for around 36 months and the paletas about 24 months. The ventilation and temperature of the places also plays a role. This is what makes the Huelva appellation the most recognised, since it is not too cold in winter, and the summer heat is attenuated by the wind blowing in from the Atlantic in the south. How do I store the ham once a cut has been taken? Once the ham is opened, it should be kept in a cool, dry place. It is recommended that you cover the cut part with the fat rind, which prevents it from drying. It is useful to have one or more sharp knives around. The process can also be helped by a support that holds the ham while it is being cut, but it is not essential (the butcher shop of Encarnación market does not use one, for example). Start by cutting the rind, then the first layer of fat.There are numerous videos that explain in more detail, but remember that in Spain the slices are cut are thin and small, about 5x5 mm. The slices should be almost transparent.